It seems that every excursion recently has resulted in unintentional shopping. Case in point: on Tuesday I ran a quick errand at Target and walked out with two long sleeve shirts, two short sleeve shirts, and three pairs of pants, all from Mossimo! I wore my new earrings yesterday and I love how the sparkly stones and the gold setting complement each other. 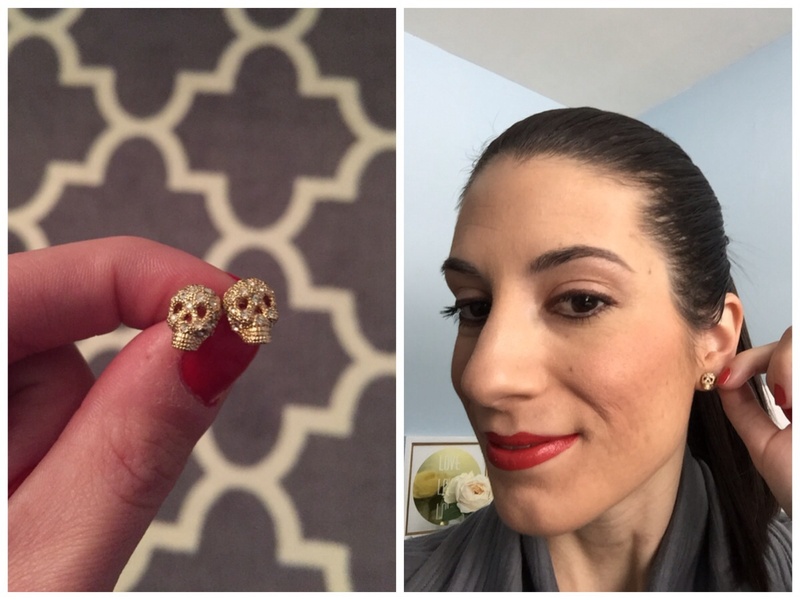 The skulls are petite enough to pass in the office without someone asking you if you are wearing skull earrings, yet are a subtle accessory for an edgy look. This was the best thing to come out of my lengthy wait at Verizon…aside from my new phone with all of my apps, of course! Thanks Danielle! I love them. I’ve already worn them twice and they are sure to be a favorite. Those skull earrings look just like McQueens! What a great find! Love those earrings! So cute. Those earrings are the shiz! Love them on you!